Ministry of Statistics and Programme Implementation (MOSPI) has just released the 6th Economic Census Report, which reflects the operational and economic variables based on the data provided by various establishments in the country. The following sectors were kept out of this research: agriculture, public administration, defense and compulsory social security services activities. As per the data shared, Maharashtra has emerged as the largest employer among all states whereas Manipur had the fastest growth of employment. 34.35% growth in employment all over India is an excellent figure, as it boils down to 4.3% average growth every year. At the same time, our population has increased at a rate of 2% annually. Hence, employment opportunities were generated at double the pace of population increase. The data has been compiled for the 8 year period from 2005-2013. As per the report, total employment inside India rose by 34.35% to 12.77 crore wherein urban areas witnessed stronger growth compared to rural areas. Proportion of women workforce marginally increased to 20.56% compared to 20% in 2005. Interestingly, more women in rural areas are working compared to women in urban location. Only 19.8% of women in urban India go to work, compared to 30.9% in rural India. 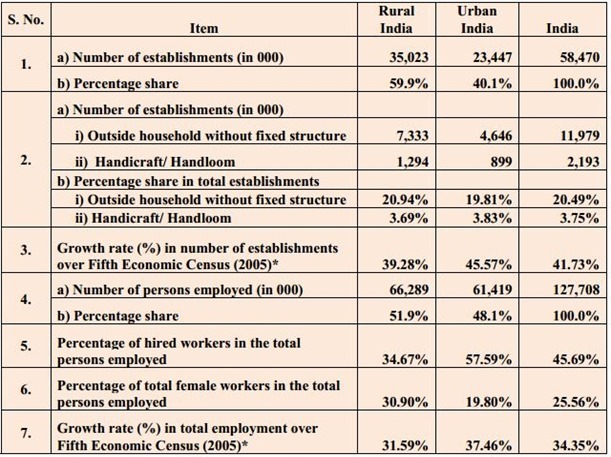 Here is a table that shows economic census categorized for Urban and Rural India. In case we observe this data as per political developments, then we will find that employment opportunities were better under Congress rule, compared to BJP’s governance. During the period 1998-2004, when 5th Economic Census was conducted, it was observed that overall employment in India grew by 2.5% annually as 9.5 crore new jobs were generated, compared to 4.3% in the Congress ruled period (2005-2013) when 12.77 crore new jobs were generated. The report also states that currently there are 58.5 million business establishments in India, compared to 42.1 million in 2005; which means new companies and organizations were added at a growth rate of 38.9% during the last 8 years. Out of this, 60% of new establishments opened in rural areas. You can access complete report here. "Maharashtra Biggest Employer, Manipur Has Fastest Growth [6th Economic Census Report]", 5 out of 5 based on 1 ratings.